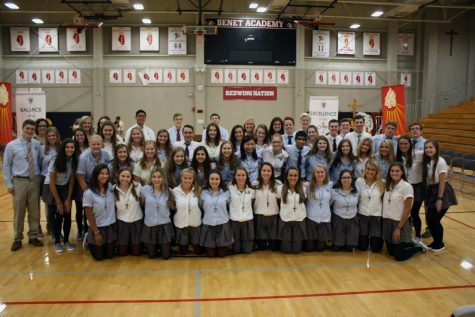 Diversity Leadership Council may be one of the newer clubs at Benet Academy, but it has already proven to be one that provokes inspiration from all of its members. DLC, which is entering its third year as a club at Benet, is a student-led club whose goal it is to work together to create an inclusive environment where diversity is celebrated and differences are respected. They have bi-weekly meetings which are open to all students. The club organizes various fun activities to bond as a group and learn more about diversity. Some examples of past meetings have been making posters to advertise the club, watching videos about diversity, talking about diverse family traditions, and decorating the halls for different cultural holidays. These are just a few examples, and there are so many other fun meetings and service events planned. This year, some new board positions will be assisting the organization of new events and coordination of the morning meetings. DLC members will also be ordering official club t-shirts, and anyone interested in joining the club is able to get one. Anyone and everyone is welcome to attend DLC’s meetings, and the group wants to reiterate that you don’t have to consider yourself ‘diverse’ to join – everyone is welcome and needed to come help cultivate an accepting and hospitable community. So come and stop by DLC’s next meeting, have a snack and learn more about what we can do to celebrate diversity at Benet.